Polka Dot Overload | Sewing, knitting & vintage projects, tips, tutorials and cartoons! 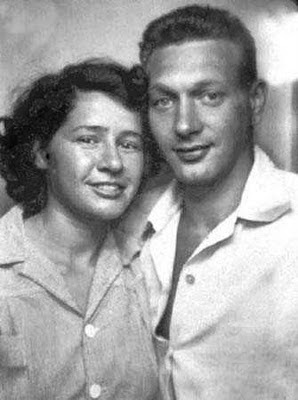 : The Vintage Singer Mystery Solved! 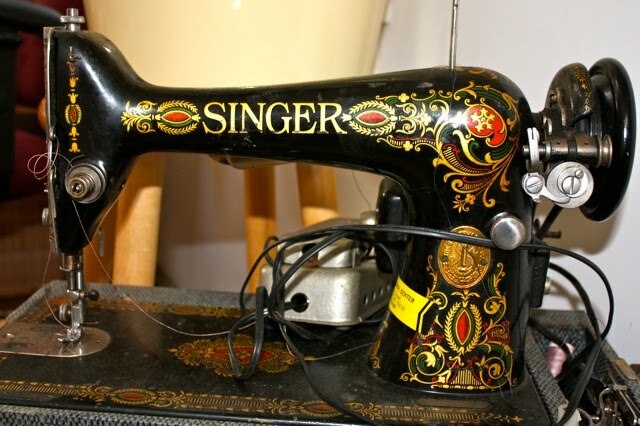 I mentioned yesterday that my mother and I were still puzzling over the origins of the beautiful vintage Singer that turned up in her flooded basement the other day. Mystery solved! After some thought and digging around in her own basement, my Bobie (grandmother) realized that it was indeed her first sewing machine, the one she learned to sew on in the 1950s--she even found the thread and projects she had for it, and the table she had it installed in. She apologized for not recognizing it instantly--but I told her that when you're 87, you're allowed to forget things occasionally! Eventually they moved to a bigger house and she decided to learn to sew dresses for her two daughters--who had particular ideas about what they wanted to wear, unlike my dad!--and clothes for herself. She thinks she got the machine from her family, and that they had had it for quite a few years before that. When she upgraded to a newer machine many years later, she gave the old Singer to my parents, and into the basement it went. 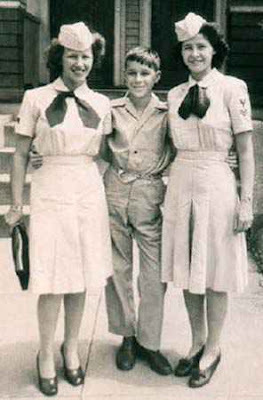 Here's a photo of Sylvia (that's her name, by the way--Sylvia Katler, born Sylvia Fishman) in the 1940s looking sharp in her Coast Guard uniform--she's on the right, and that's her sister Sarah and brother Milton. Most of her nine brothers and sisters were also in the service during WWII (Milton was too young, but served in the Korean War). 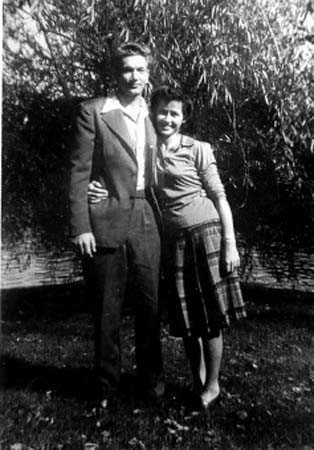 Here are some photos of her with my grandfather Leon Katler, also from the 1940s--don't they look glamorous? 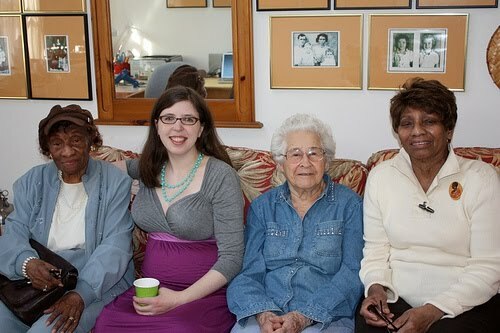 Here's a recent photo of me and Sylvia at my baby shower, with my grandmothers-in-law Theresa and Wilhelmina! 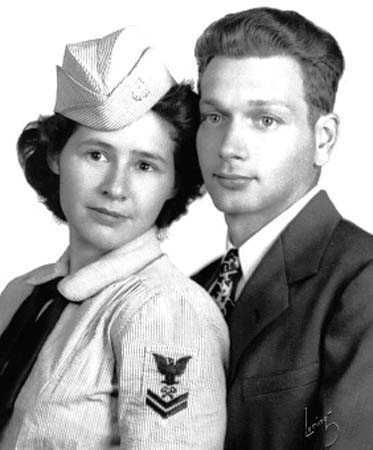 And should you be interested, in college I put together a short collection of some family stories she told me about her life growing up in old Jewish Boston, her time in the Coast Guard, and beyond! Vintage Singers are not that uncommon. They hit huge production post war. The detailing on that one is delightful! Yes, I know they're relatively common--a friend of mine has one that she uses as her main sewing machine, too, but it doesn't have that paint job! I'll ask my mom to give me the serial number. She lives five hours from me, and I won't be traveling until well after Cartoonist Baby is born! Oh, and I bet it does work fine--it was fine when my grandmother gave it to my parents, and I don't think it got any of the flooding on it. 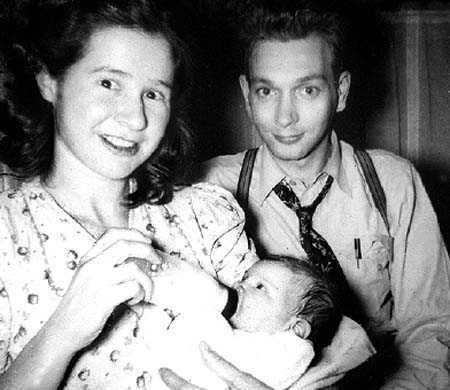 Lovely story and photos - and what a great picture of you, your grandma, and grandma-in-laws! What a cool story! :) I wish I had something my grandmother made passed down to me. I love the look of this machine. So beautiful. Thanks for sharing the story, especially the link to your grandparent's story. Loved it all. The pictures were just gorgeous.